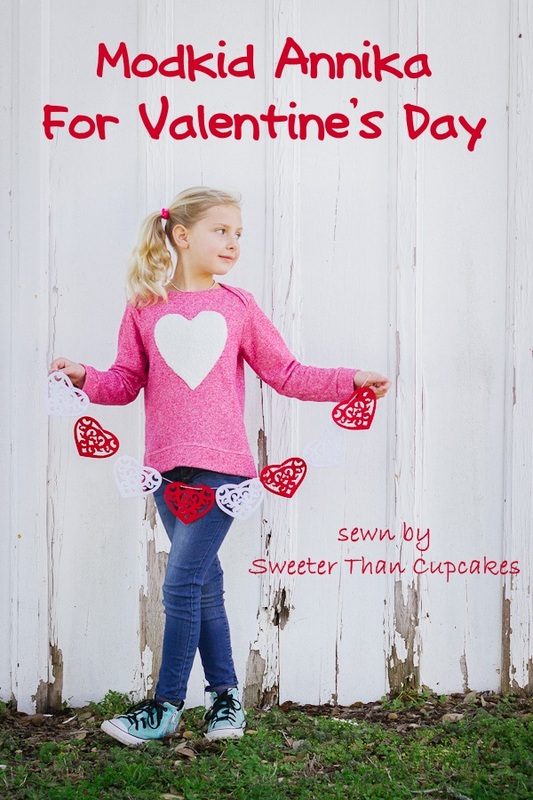 Valentine's inspired sewing projects that last all year are the best kind. The Modkid Annika sweatshirt sewing pattern was the perfect starting out point for our look. This isn't just any old giant heart, however. It is a giant heart made with Sherpa fabric from Joann's making it the softest heart imaginable. And, doesn't a little added texture go a long way?!? This Sherpa fabric started off as a cozy sweatshirt for me, but three quarters of the way through the making, I realized I was going to look like a giant marshmallow. Not good! Every time Tandy came into the sewing room, she would pet the fabric, so I knew anything with a bit of that Sherpa on it would be a hit with her. I have enough Sherpa for about 100 of these hearts, so I have to figure out another way to use the fabric eventually. Tandy, at seven, still sleeps with a minky lovey, and usually wants it up close to her face. She gravitates toward anything super soft. Sewing allows me to incorporate those special touches that make each item unique and also uniquely tailored to my daughters' favorite things. What type of thing do you or would you include to personalize a garment? I have to admit, it was hard to capture the texture of that white heart on this bright day! I wasn't sure Sherpa fabric would work well for an applique, but I had no trouble. Using stabilizer on the the wrong side of the pink french terry fabric and heat-and-bond to secure the Sherpa heart, made the application easy. The only thing I would suggest is sew a bit further in from the edge of the Sherpa fabric to ensure you are grabbing it and not just the fluff of the texture. The stitches practically disappear in the loft of the fabric! Tandy is becoming quite the fashionista. She picked the perfect shoes to wear then, insisted we bring this envelope cross-body purse as an accessory. This purse is on its last leg, so maybe my next project should be an new one! One last close up to highlight my favorite feature of the Modkid Annika Sweatshirt pattern. That lap neck detail makes me swoon.